The bus from Athens was long. Thankfully, though, I hadn’t slept much the night before which enabled me to sleep a lot on the bus. In Istanbul I know enough Turkish to get around and pick up things people are saying around me, and my travels thus far had been with people I knew, but now I found myself in the isolation of not knowing a word of whatever language was being spoken. All I could tell was that people on the bus were talking about me because I heard “American” every once in a while. Aside from one Greek girl I’m pretty sure I was the only non-Albanian on the bus. It was raining when we got to the border at Kakavia. I hadn’t seen rain in about a month so it seemed ominous that it should start raining for the start of my time in Albania. As the rain beat down and the bus navigated its way around the potholed streets, I gazed out of the window trying to spot the pillboxes. Once I got used to seeing a few of them on the hillside I started seeing them all over the place. 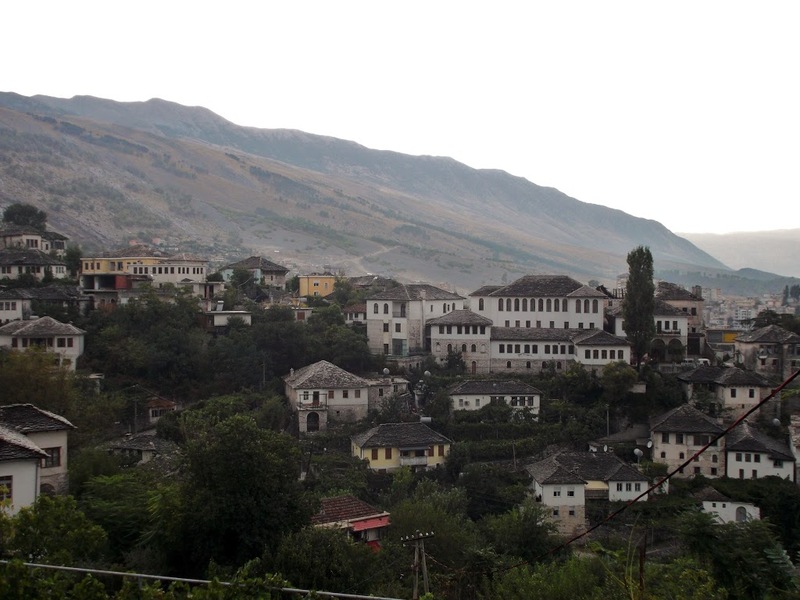 After passing a few little towns, the bus stopped briefly at Gjirokaster, the first city after crossing the border, before making its way on to Tirana. I got off the bus and got my bag from down below the bus. It was still raining and I had no idea about where to go in Gjirokaster. Usually I travel with a guidebook but I decided to wing it this time around. Traveling solo means that you can change your itinerary in a split second. Traveling with only a loose idea of cities to go to means that your itinerary is subject to change even quicker. And traveling without a guidebook or any idea of where you will stay once you get to any of these cities means that you’re really flying by the seat of your pants. There was a taxi driver where the bus dropped me off and he jabbered something at me. “Well, I need a hotel of some sort to sleep for the night.” Hotel? Okay. I got in the cab and we sped off in the rain up some winding streets, past a bank I took note of to get out some money since I was running low, and eventually stopped in front of a shady looking bar. The barman ran the dive of a hotel next door, and spoke a bit of English so I agreed to spend the night for 1000 leke, roughly eight dollars. I paid the cab driver and the barman told me to sit down for a while. He eventually showed me my room, which was about what you would expect for the price. Hot and humid from the rain with no air flow, and an uncomfortable bed with a few sheets on it. Squat toilet in the hall with no toilet paper and a shower head next to it with a drain in the floor and no shower curtain. 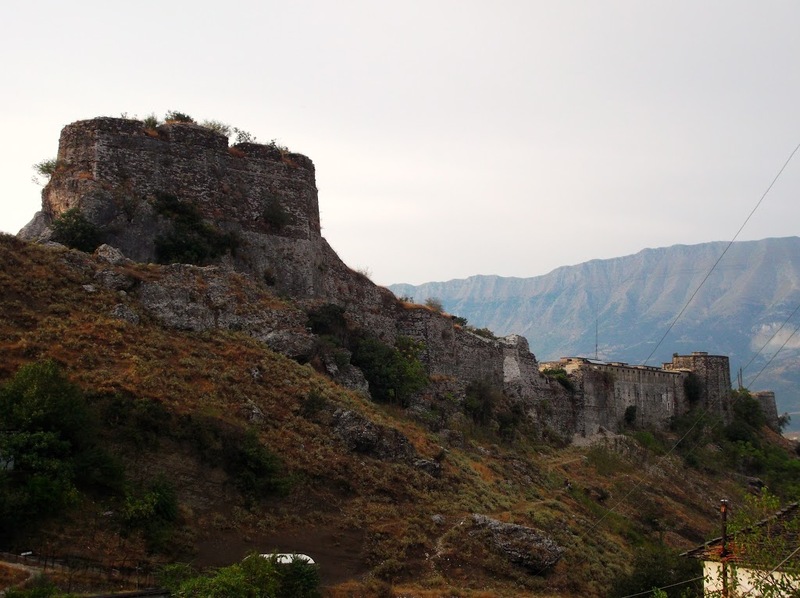 I had my first Albanian shower of not quite cold water that dripped out of both faucet and shower head and dried myself with the bare towel provided and headed out to see Gjirokaster. I headed up the hill to see the castle. There really wasn’t much information available, but it was a nice place to wander around. By now the rain had stopped and it was just hot and muggy. After the castle I tried to find where the museum for Enver Hoxha’s house was. I saw a few signs directing me to museums but could never find any of the museums. A few days later I learned that his house is now the ethnographic museum, which I had looked for but couldn’t find. I decided that I should probably get some money out of the ATM, as I only had 10 euro and 600 leke, most of the euros going towards the hotel, and the leke wouldn’t get me very far. Of the three ATMs I found, however, none of them accepted either my Turkish bank card or my US bank card. I was now cursing my purchase of duty free whiskey and a few postcards earlier that afternoon, spending my precious euro. I wondered how long I would be stuck in this place. I walked in to a small restaurant and asked the guy if he accepted credit cards. No, but he pointed me to an ATM down the road. His English was limited so I gestured that it didn’t work. He pointed to the ATM up the road, again I gestured that it didn’t work. I shrugged my shoulders and started to make my way for the door. He gestured to me about eating, said today? and lifted hands in a questioning manner, to which I shook my head and said that it was okay. He said no no no, he would give me rice, salad and a beer and I could pay him tomorrow. I said “no, no, no worries” but he took my hand and led me to a table. He said I could pay him 400 leke tomorrow when the bank opened. I was surprised it was so cheap (around three dollars) and though I had 600 leke on me decided that I would save it and just pay him tomorrow anyway, it was a gesture of kindness and I wouldn’t ruin it by telling him I actually did have enough for the meal. I sat down in the hotel bar and had a cheap beer and got talking to three Polish tourists who had been backpacking around Albania for a while. They were quite fond of Albanian rakia, the local plum firewater and plied me with a few rounds of the stuff before I wandered up to bed. I woke up fairly early and walked up the hill to pay the restaurant guy the 400 leke from my dinner and thanked him again and made my way down the hill to look for a bus. 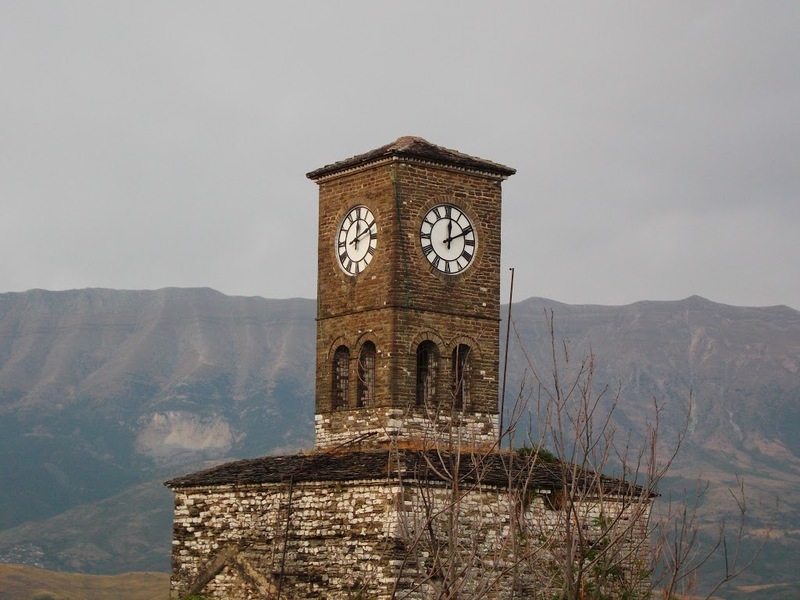 Gjirokaster is a UNESCO world heritage city, so the old town is touristy, in an Albanian way. There are a few hotels where people speak a little English, some shops selling trinkets, a few restaurants and cafes where the patrons speak a bit of English, and a few signs pointing to museums which you might find if you’re lucky. 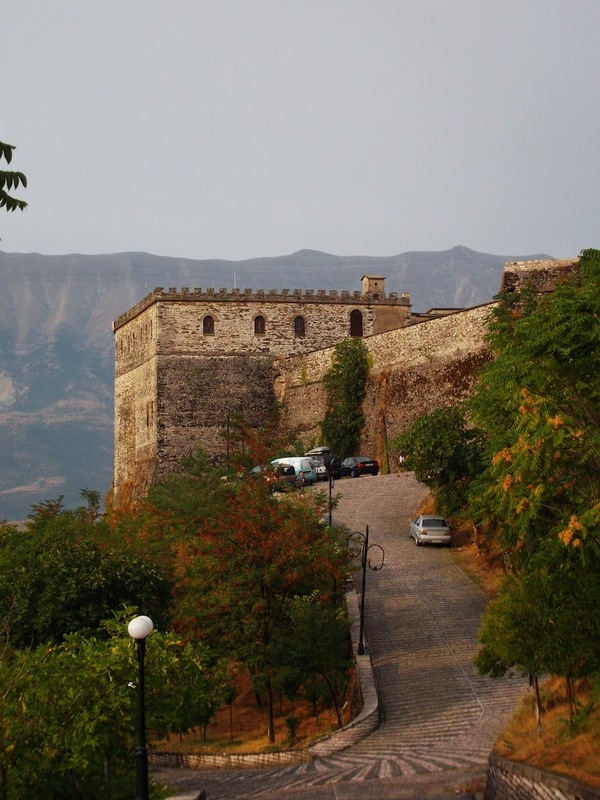 Gjirokaster is famous for having a decently preserved old Ottoman town. Lots of old Ottoman houses that are in pretty good condition and an old castle. It’s quite a nice old town. The rest of the town, however, is not so nice. The buildings outside of the old town are all the same concrete apartment blocks, and many of them are abandoned and in various stages of disrepair or are collapsed. The roads have gaping craters and garbage is scattered all over the roads, and by the dumpsters it is piled in heaps. There are a few shops around and a grim looking cafe or two, but nothing to make it look like a city to visit other than the little old town upon the hill. I made my way to where the bus had dropped me off and set about walking further, looking for where there might be a bus station. 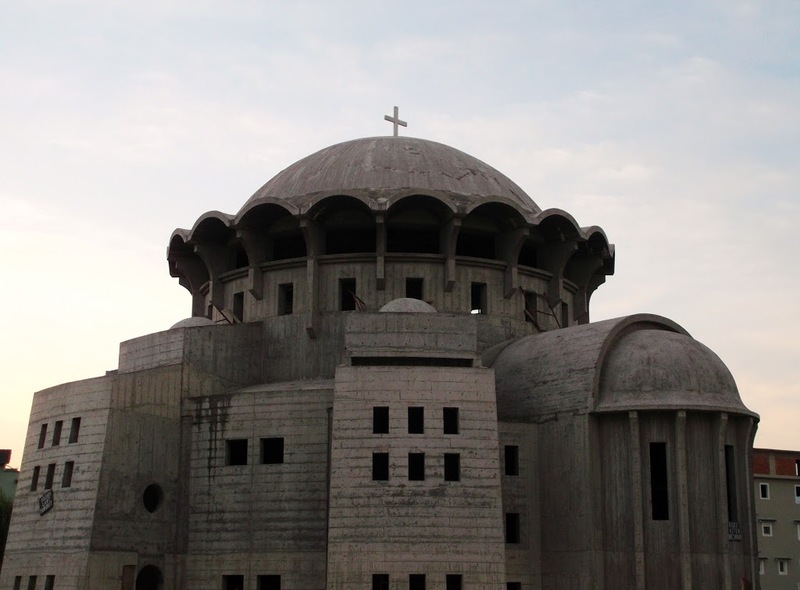 For my next stop, I had selected the scenic southern city on the sea, Sarande. I had no money so I needed to find an ATM that would accept my card in order to get a ticket there. My best guess about the ATMs I had tried earlier was that they were only for Visa cards, so I found a bank with a Mastercard sign, and sure enough, I was able to get money out. I breathed a sigh of relief and looked around for buses. Minibuses (Furgons here in Albania, Dolmuses in Turkey, Marshrutkas in Georgia) were gathered along the main road I’d been heading down, and a bunch of them were lined up for Sarande, so I loaded my bag in the back and got on. The minibus was packed and hot, the roads narrow and winding through the hills, and the driver quite reckless. One old woman on the bus was ill for the journey and was moaning with her head resting on the seat in front of her, vomiting into a plastic bag. I was quite happy to be rid of my flu symptoms and feeling at the top of my game, looking forward to seeing the sea in scenic Sarande.